He's dubbed the godfather of urban fashion and the people's shark. The FUBU founder and 'Shark Tank' investor opens up about hustling his way to millions, beating Mark Cuban, & what the $1.5 billion Powerball winners should do with their newfound wealth. "I started with the love for this amazing new music called hip hop that was coming around in the early 80s. It was kind of like Twitter and Instagram. It was a destructive technology because the kids were talking to each other through the music about their hopes, their dreams, their aspirations, and the plight of the community. We never got to see that on television. I wanted to dress this community because nobody else was dressing this community, so i started to make hats one at a time and sell one at a time." - Daymond John on his start in the fashion industry. "That was the power of broke and I realized after closing something three times that you desperately want this thing to happen and it doesn't matter. You'll sacrifice all or whatever you have to make it succeed. That gave me power, gave me discipline, it gave me energy and it gave me drive." - Daymond John on the power of being broke. “Who's going to ever make something for us, by us? A community. A culture. Not a color because then we didn't want to be guilty of the same prejudices that these people were putting on us. And that's when we came up with Fubu." "I would go and find these pencils and I would scrape the paint off the pencils. I'd paint the name of the prettiest girls in school on the pencils. I'd go over to the guys and say, ‘Hey, you don't want to knock her teeth out, do you? You want to sit with her. Why don't you buy this pencil from me with her name on it and then you can sit with her at lunch and give her the pencil.’...I found out what vanity was. I found out that the girls would pay two times the amount of money for the same exact pencils and that’s how I started making money." - Daymond John on his first business. "We didn't think it was ever going to last past the sizzle reel. Then lo and behold, seven seasons later. It is something I’m very proud of being part of." 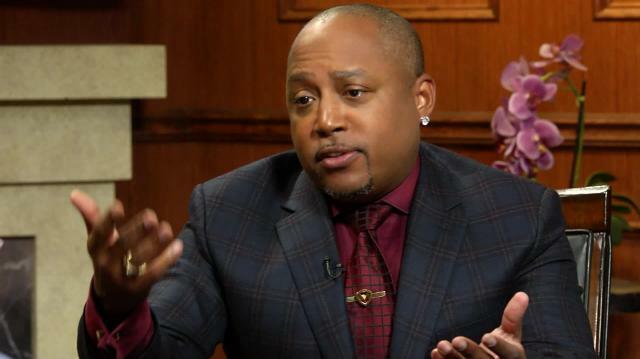 - Daymond John on the unexpected success of NBC’s Shark Tank. "I would say about 40% now are doing extremely well. I would say if you asked me that 3 years ago, I would say about 25%, so every year it probably grows a little bit." - Daymond John on his percentage of successful investments. "A great entrepreneur is somebody who learns from their mistakes. They know that they're going to fail way more than they are going to succeed. They surround themselves with like-minded people. They know that they need mentors in their life. They take an affordable stance and they act, they learn, and then they repeat. And these are people who have a drive. They know they need to get up before everybody in the morning and go to bed after everybody and not let anybody out hustle you." "I would say, first of all, once you get that ticket and if you are not all over the news, you call up everybody you can and ask to borrow money from them and see who lends you the money." - Daymond John’s advice for the recent powerball winners. "I would absolutely recommend college to others." "Auctions. Buying everything that I can at an auction." - Daymond John on his guilty pleasure. "It's gonna be between Tom Ford and probably Dsquared2" - Daymond John on his favorite clothing designer.